This MRP Stage Fork was a bit noisy but worked really, really well (click to enlarge). The Canfield Brothers Riot is one of those bikes that flew under the radar for me for quite awhile. I was super interested in the Balance last year but never could quite hook up with the Brothers to get a test ride. Meanwhile, discussion about the Riot kept appearing at the top of the Mtbr Canfield forum. As I got wading through the 70+ pages of e-speculation and e-anticipation I started to see why so many people were excited about this bike. 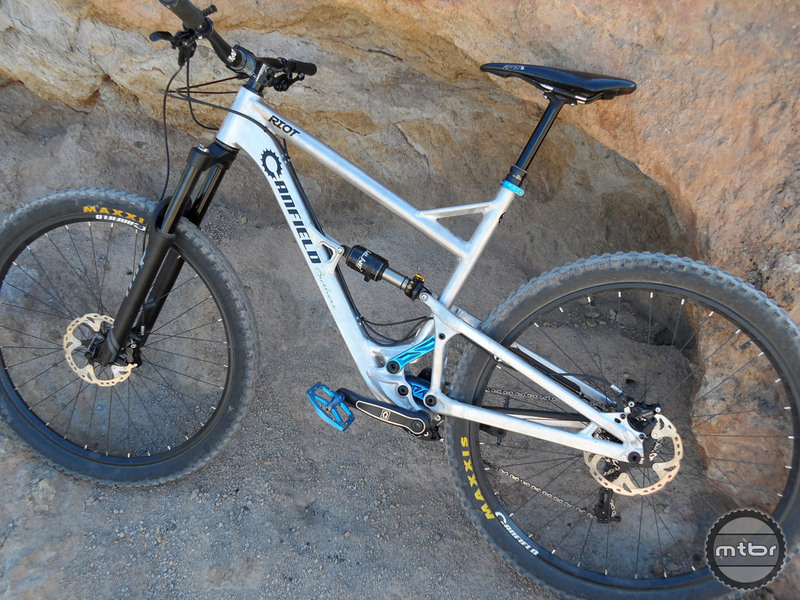 Canfield Brothers was one of the first companies to make an aggressive, fun 29er, with its Yelli Screamy all mountain hardtail back in 2011. 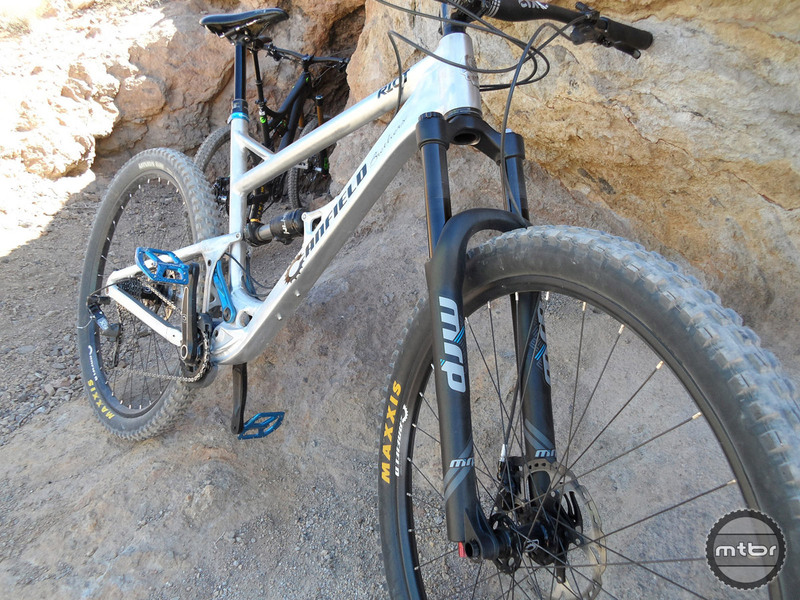 But with the Riot they’ve taken the aggressive, yet playful 29er concept and turned it on its ear. 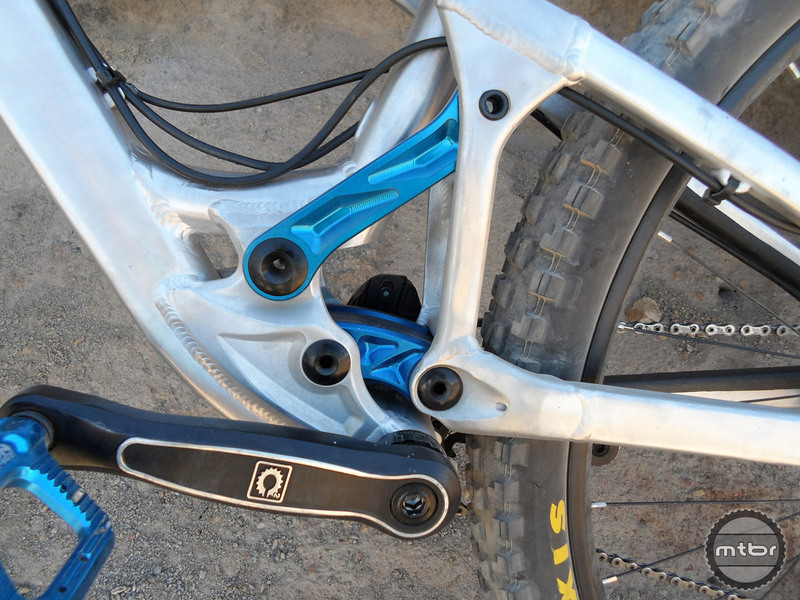 The Riot is a FS 29er with 140mm of rear travel, 66.5-degree head angle, and downright stubby 16.3″ chain stays. How can you NOT want to ride a bike like that, especially after Evil has been taking the world by a storm with its own short travel aggressive 29er, The Following? We got our chance after meeting up with Lance Canfield at Interbike’s Dirt Demo Expo. In fact, I got to ride Canfield’s personal size large Riot. Love the raw with blue ano bits. Very sharp (click to enlarge). Canfield is 15 pounds lighter than me, but rides quite a bit more aggressively so his suspension settings ended up being spot on. The fit of the size Large, which sports a somewhat short effective top tube length of 24″ has a generous and roomy 18″ reach, which is the number that matters more to me when it comes to fit. The stack and bottom bracket height are a bit tall at 24.8″ and 13.78″ on paper, but for a longer travel 29er those numbers aren’t bad and what’s more important is how the bike functions on the trail. This bike felt right. Canfield explained that the slot car, in-the-bike feel comes from having the BB below the axles yet still allowing for good pedal clearance in the rocks. The steep 76-degree effective seat tube angle puts the rider in a really good position to keep the front wheel planted on steep climbs. Anodized awesomeness. No lateral flex was noted in these stout links or rear triangle (click to enlarge). We shuttled to the top of Bootleg Canyon and took the bikes down the fast, rocky, and ledgy Boyscout trail, which really tests a bike’s high speed stability and gives the bike plenty of opportunity to show how it manages steep, tight, rocky switchbacks and pop over boulders and small drop offs. Wow, was the thought that kept coming to my mind as I flew down the upper half of Boy Scout. This thing is a Riot. Lifting the front end was so effortless and so fun that you just wanted to manual everything. Except that popping over those same obstacles was also so entertaining that each successive hit had you trying to decide which to do. My only other thought as I was bombing that particular section of trail was how cool would this thing be with some nice fat 27.5+ wheels and tires on it. The Brothers have experimented with 27.5″ wide rims and plus sized tires. They claim they fit fine and take the Riot to a total frenzy level. My next challenge was the up and down East Leg trail that has a few short steep climbs, sharp switchbacks, off-camber, exposed step-up moves and tricky gully traverses. But the section I really wanted to try was a super steep, narrow, long chute back down to the main road called “The Hour Glass.” Lance Canfield had told us about it and pointed it out on the way up, thus all but requiring me to attempt it. This is a pucker factor 10 exercise in speed control on a very steep, sometimes loose, rocky chute with a couple potential wheel stoppers positioned right at the narrowest section. After a couple tenuous scoping out partial runs, the Riot took me down the Hour Glass without drama. It was a very impressive and confidence inspiring feat.